Yesterday’s weather was weird, too hot in the morning and rain in the afternoon ‘till evening. I have wondered if it will stop before dawn breaks this morning, and yes! it did stop. 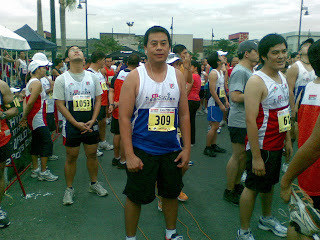 So I woke up early as planned and get ready to participate in the PAA-TIBAYAN run sponsored by BOTAK held at the Fort. I was expecting a low attendance due to the bad weather, but surprisingly runners will always be runners and they will run rain or shine. Running really does matter in whatever you do. You go out there with a plan, an objective and you prepare for it. You condition your mind and your body in order for you to be equipped during the event. I went to run with the simple objective of beating my own time (which was 71 min -10k during the Condura run), pretty slow! And yes, I was able to beat it with 67 min and 38 seconds without walking (finally!). Just a slight improvement but I’m happy with that, though I was hoping to beat my practice time of 63 min (but I guess I missed to count a lap, that’s why). I see this as an achievement cause my efforts paid off, and obviously this motivates me to practice more and hopefully I will be able to improve further in my next runs. Anyways, here are some highlights of my run. Before the run started, there was confidence and optimism that a better time will be made today. Proper conditioning of the mind to be focused on the objective and believed that it can be done was a key factor in the preparation. Have managed to get a good sleep, woke up with a light feeling, very positive and determined. During the run, there were obstacles as my feet hurts, got concerned if there was something wrong with the way I run, or I was simply focusing on the pain. Have managed to re-focus myself in the run, my breathing, and started to pace myself. I have noticed that the pain was gone and said to myself that it’s just about focus. I had concentrated on my space and just run. I slowed down uphill the bridge going back and have thought of walking as fatigue starts to fall in, but had to remind myself of the objective otherwise, that’s it for me. So I jogged slowly until I was able to get more air and started to run again (obviously with my time, my run was a very slow pace). There was no marker (or I just didn’t noticed), and I find it hard to pace myself as I was not familiar with the place. Lesson learned: Need to be familiar with the route, try to run with the course if possible before the race. It was a good run for me, will definitely practice more for my next run. One good thing is that I am not walking anymore during my laps; it’s a good sign of improvement. Small step is a start of a big stride later on. Always believe, and it will happen..
What about Baguio run? Are we ON it?